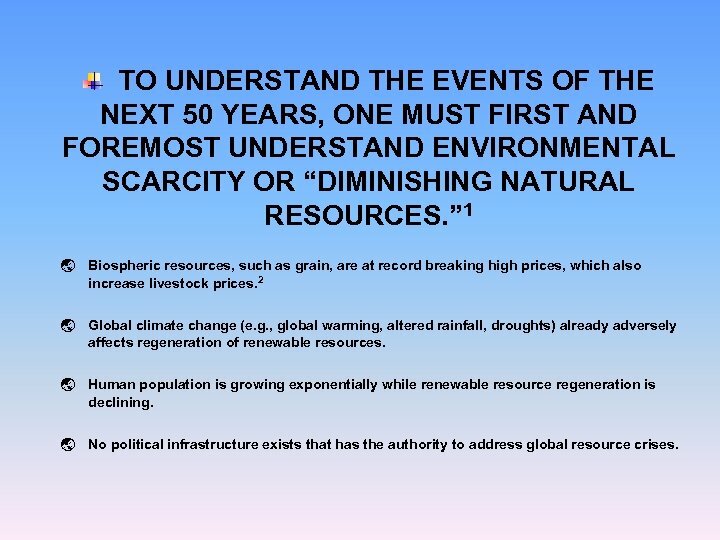 TO UNDERSTAND THE EVENTS OF THE NEXT 50 YEARS, ONE MUST FIRST AND FOREMOST UNDERSTAND ENVIRONMENTAL SCARCITY OR “DIMINISHING NATURAL RESOURCES. ” 1 ý Biospheric resources, such as grain, are at record breaking high prices, which also increase livestock prices. 2 ý Global climate change (e. g. , global warming, altered rainfall, droughts) already adversely affects regeneration of renewable resources. ý Human population is growing exponentially while renewable resource regeneration is declining. ý No political infrastructure exists that has the authority to address global resource crises. 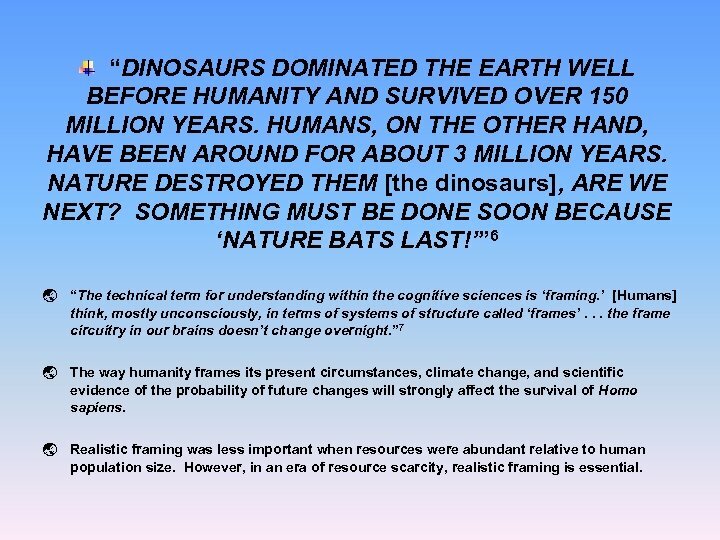 “DINOSAURS DOMINATED THE EARTH WELL BEFORE HUMANITY AND SURVIVED OVER 150 MILLION YEARS. HUMANS, ON THE OTHER HAND, HAVE BEEN AROUND FOR ABOUT 3 MILLION YEARS. NATURE DESTROYED THEM [the dinosaurs], ARE WE NEXT? SOMETHING MUST BE DONE SOON BECAUSE ‘NATURE BATS LAST!’” 6 ý “The technical term for understanding within the cognitive sciences is ‘framing. ’ [Humans] think, mostly unconsciously, in terms of systems of structure called ‘frames’. . . the frame circuitry in our brains doesn’t change overnight. ” 7 ý The way humanity frames its present circumstances, climate change, and scientific evidence of the probability of future changes will strongly affect the survival of Homo sapiens. ý Realistic framing was less important when resources were abundant relative to human population size. However, in an era of resource scarcity, realistic framing is essential. 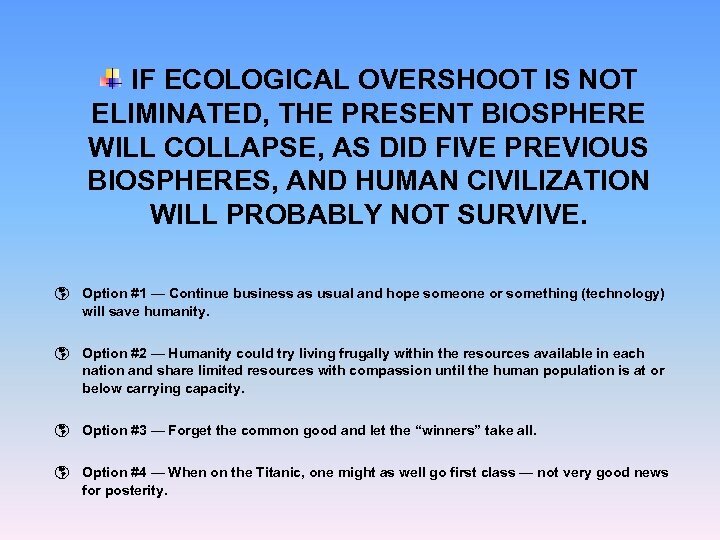 IF ECOLOGICAL OVERSHOOT IS NOT ELIMINATED, THE PRESENT BIOSPHERE WILL COLLAPSE, AS DID FIVE PREVIOUS BIOSPHERES, AND HUMAN CIVILIZATION WILL PROBABLY NOT SURVIVE. 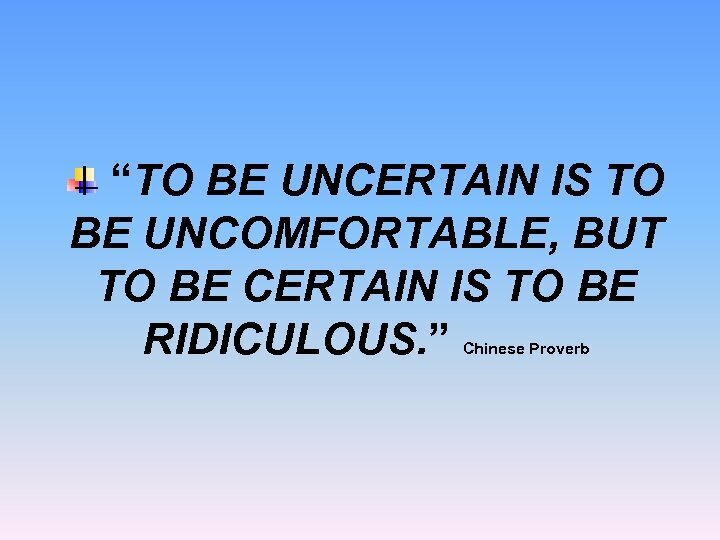 þ Option #1 — Continue business as usual and hope someone or something (technology) will save humanity. þ Option #2 — Humanity could try living frugally within the resources available in each nation and share limited resources with compassion until the human population is at or below carrying capacity. þ Option #3 — Forget the common good and let the “winners” take all. þ Option #4 — When on the Titanic, one might as well go first class — not very good news for posterity. 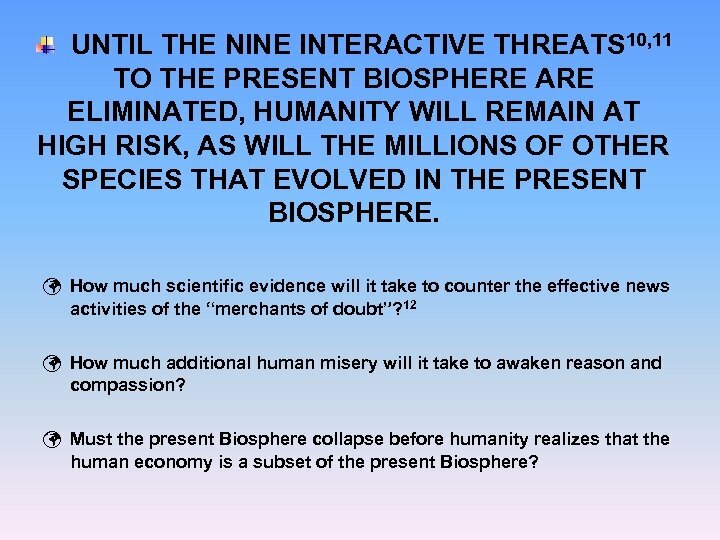 UNTIL THE NINE INTERACTIVE THREATS 10, 11 TO THE PRESENT BIOSPHERE ARE ELIMINATED, HUMANITY WILL REMAIN AT HIGH RISK, AS WILL THE MILLIONS OF OTHER SPECIES THAT EVOLVED IN THE PRESENT BIOSPHERE. ü How much scientific evidence will it take to counter the effective news activities of the “merchants of doubt”? 12 ü How much additional human misery will it take to awaken reason and compassion? 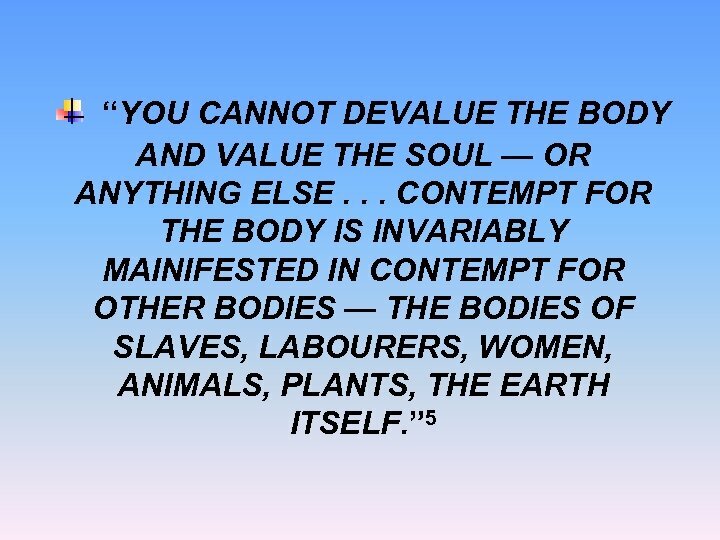 ü Must the present Biosphere collapse before humanity realizes that the human economy is a subset of the present Biosphere? HUMANITY’S ANCIENT TRIBAL ANCESTORS PAID CLOSE ATTENTION TO THE HABITATS FROM WHICH THEY OBTAINED THE RESOURCES NECESSARY FOR THEIR SURVIVAL — IF THEY HAD NOT, THEY WOULD NOT HAVE SURVIVED. þ Tribal ancestors were far from perfect since they drove some megafauna to extinction by over hunting. þ However, Homo sapiens managed to live sustainably for approximately 200, 000 years. þ The six other species in the genus Homo lived sustainably for approximately 4 million years. 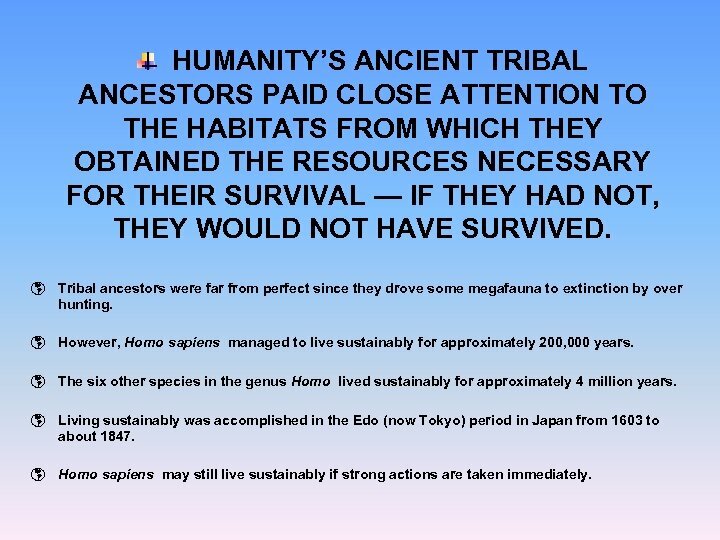 þ Living sustainably was accomplished in the Edo (now Tokyo) period in Japan from 1603 to about 1847. þ Homo sapiens may still live sustainably if strong actions are taken immediately. 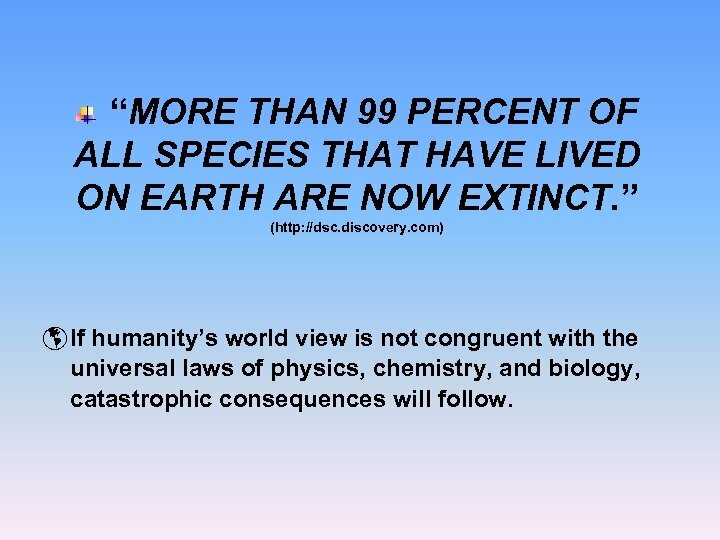 “MORE THAN 99 PERCENT OF ALL SPECIES THAT HAVE LIVED ON EARTH ARE NOW EXTINCT. ” (http: //dsc. discovery. com) þ If humanity’s world view is not congruent with the universal laws of physics, chemistry, and biology, catastrophic consequences will follow. 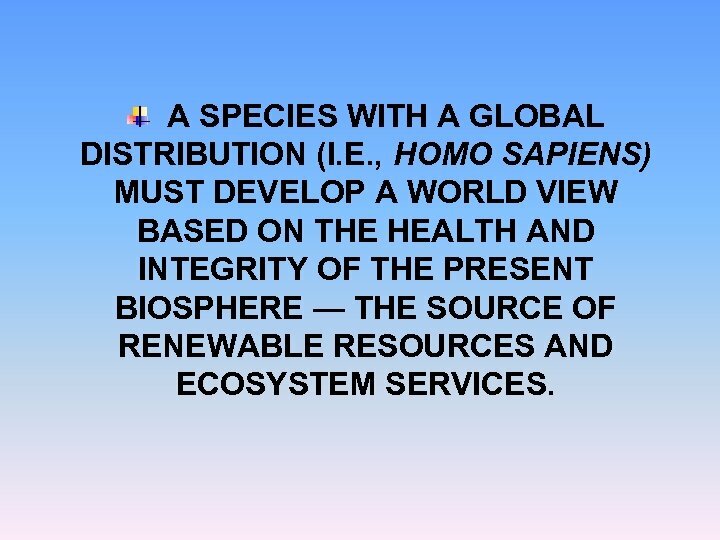 A SPECIES WITH A GLOBAL DISTRIBUTION (I. E. , HOMO SAPIENS) MUST DEVELOP A WORLD VIEW BASED ON THE HEALTH AND INTEGRITY OF THE PRESENT BIOSPHERE — THE SOURCE OF RENEWABLE RESOURCES AND ECOSYSTEM SERVICES. Acknowledgments. 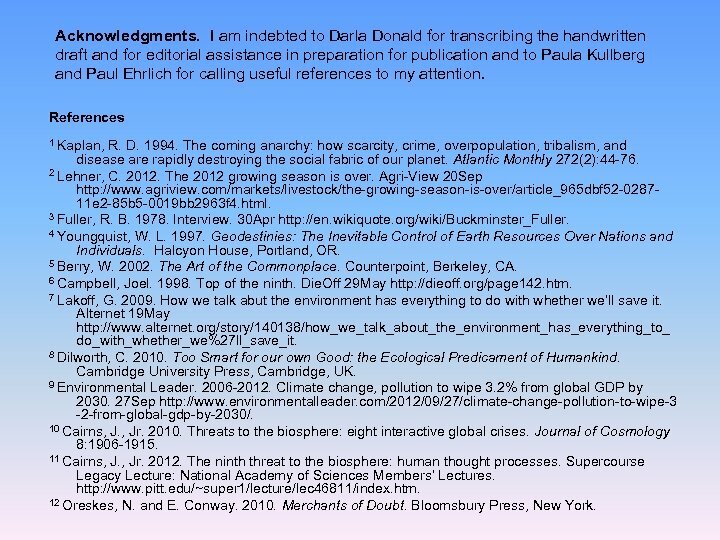 I am indebted to Darla Donald for transcribing the handwritten draft and for editorial assistance in preparation for publication and to Paula Kullberg and Paul Ehrlich for calling useful references to my attention. References 1 Kaplan, R. D. 1994. The coming anarchy: how scarcity, crime, overpopulation, tribalism, and disease are rapidly destroying the social fabric of our planet. Atlantic Monthly 272(2): 44 -76. 2 Lehner, C. 2012. The 2012 growing season is over. Agri-View 20 Sep http: //www. agriview. com/markets/livestock/the-growing-season-is-over/article_965 dbf 52 -028711 e 2 -85 b 5 -0019 bb 2963 f 4. html. 3 Fuller, R. B. 1978. Interview. 30 Apr http: //en. wikiquote. org/wiki/Buckminster_Fuller. 4 Youngquist, W. L. 1997. Geodestinies: The Inevitable Control of Earth Resources Over Nations and Individuals. Halcyon House, Portland, OR. 5 Berry, W. 2002. The Art of the Commonplace. Counterpoint, Berkeley, CA. 6 Campbell, Joel. 1998. Top of the ninth. Die. Off 29 May http: //dieoff. org/page 142. htm. 7 Lakoff, G. 2009. How we talk abut the environment has everything to do with whether we’ll save it. 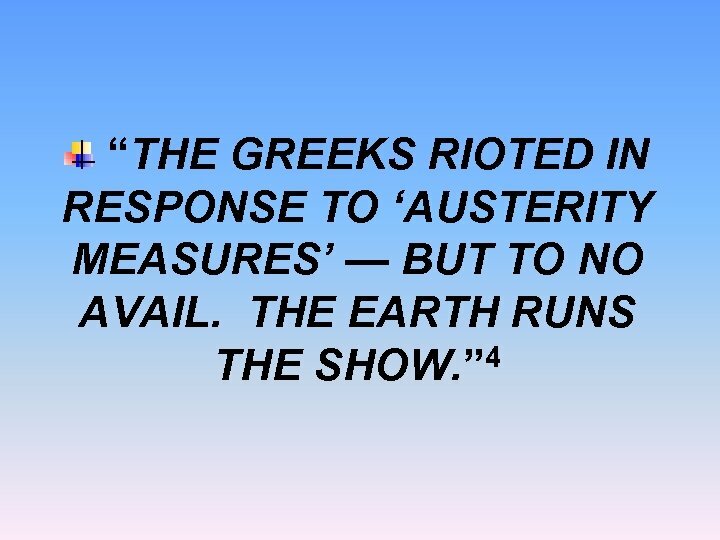 Alternet 19 May http: //www. alternet. 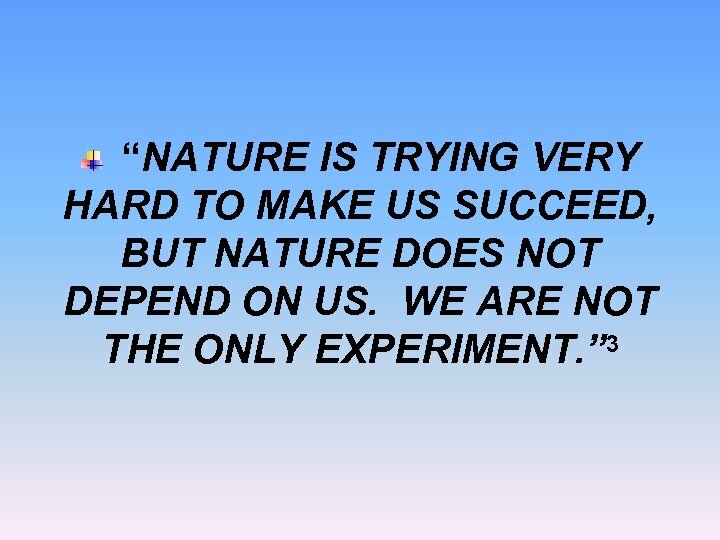 org/story/140138/how_we_talk_about_the_environment_has_everything_to_ do_with_whether_we%27 ll_save_it. 8 Dilworth, C. 2010. 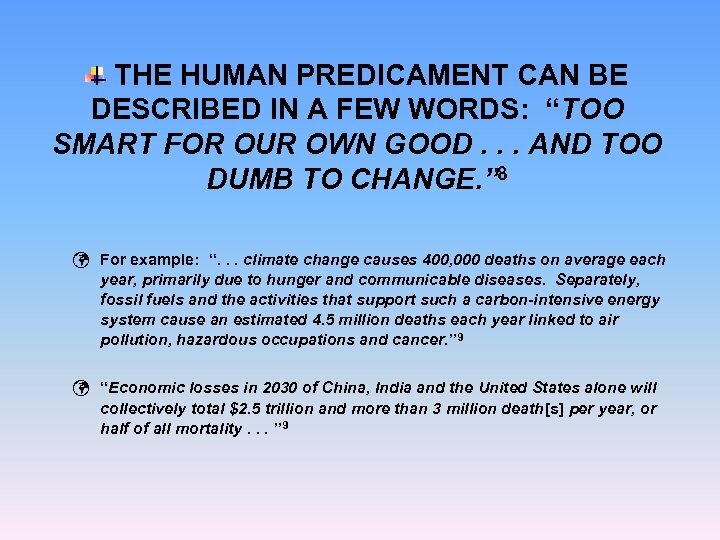 Too Smart for our own Good: the Ecological Predicament of Humankind. Cambridge University Press, Cambridge, UK. 9 Environmental Leader. 2006 -2012. Climate change, pollution to wipe 3. 2% from global GDP by 2030. 27 Sep http: //www. environmentalleader. com/2012/09/27/climate-change-pollution-to-wipe-3 -2 -from-global-gdp-by-2030/. 10 Cairns, J. , Jr. 2010. Threats to the biosphere: eight interactive global crises. Journal of Cosmology 8: 1906 -1915. 11 Cairns, J. , Jr. 2012. 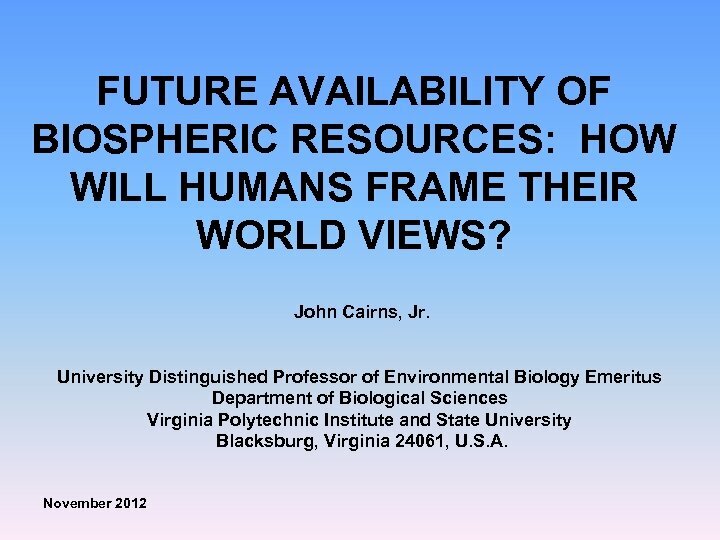 The ninth threat to the biosphere: human thought processes. Supercourse Legacy Lecture: National Academy of Sciences Members’ Lectures. http: //www. pitt. edu/~super 1/lecture/lec 46811/index. htm. 12 Oreskes, N. and E. Conway. 2010. Merchants of Doubt. Bloomsbury Press, New York.